Round Cut Genuine Aquamarine in Grade AAA AfricaGems stocks beautiful faceted deep blue Grade AAA Natural Aquamarine gemstones. In standard sizes, AAA Grade is the finest quality available on the market. It is sometimes not in stock in the larger sizes (5.50mm+). 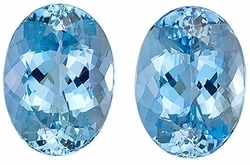 These fine Aquamarine stones will display a bright deep rich blue color of a deep tone (as picture shows). These gems have been faceted to a very high professional lapidary standard and have a very good make, polish and symmetry. It has a clarity rating of Eye Clean Plus (VS), meaning that it can have very minute inclusions that can only be seen with the aid of a microscope. All of our Aquamarine gemstones have undergone traditional heat treatments. Our Aquamarine gemstones are primarily sourced from Zambia and Mozambique in Africa. What is an Aquamarine Gemstones & How Did It Get The Name? Aquamarine - What do you think of when you hear the word 'Aquamarine?' It is a natural gemstone that can conjure up images of the beautiful blue waters of an Alpine lake or a clear beautiful light blue sky at sunrise. For those into etymology, the word aquamarine comes from the Latin words aqua for water and marine for sea. Aquamarine gemstones can be a pale almost colorless blue or they can be a bluish green or a greenish blue or a light green similar to a light colored emerald or they can be a clear blue similar to a light blue sapphire. 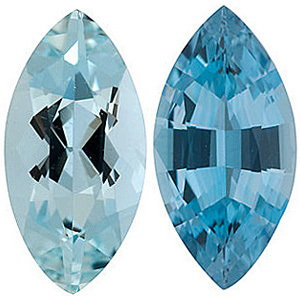 In fact, many people believe the best aquamarine is the vivid color of a light blue sapphire. 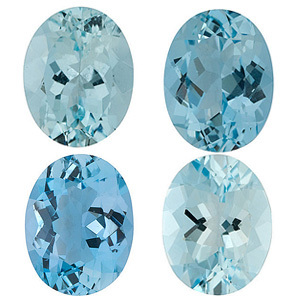 But even the best aquamarine will not have the blue tones of a top quality royal blue sapphire. Aqua just doesn't come in that dark a tone of blue. Gemstone 'fashions of the day'seem to dictate which color aquamarine is in favor in a particular year. For example recently, natural bluish green uncut aquamarines have become quite popular in multi-strand or torsade style necklaces, but clear blue polished aquamarine necklaces will always be highly prized. Aquamarine is a member of the beryl (sometimes referred to as precious beryl) family of gemstones. This gemstone family includes the very coveted emerald, the fairly newly discovered Morganite (discovered in the early 1900s by J.P Morgan), golden (Heliodor) beryl, Goshenite (colorless), Bixbite (very rare red beryl) and green beryl (almost a separate species from emerald as they are usually eye clean and they are a much more pastel light mint green color). It is unlikely that you will find any beryl other than emerald or aquamarine in most jewelry stores. They 'other'beryls are primarily collector gemstones although Morganite has been gaining some popularity recently. 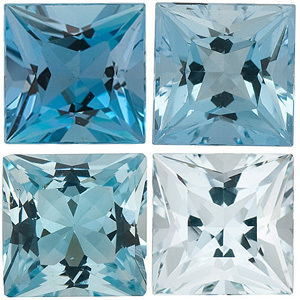 In the 1980s when the process for enhancing colorless topaz to make them a medium toned blue was introduced, aquamarine fell out of favor for a time. 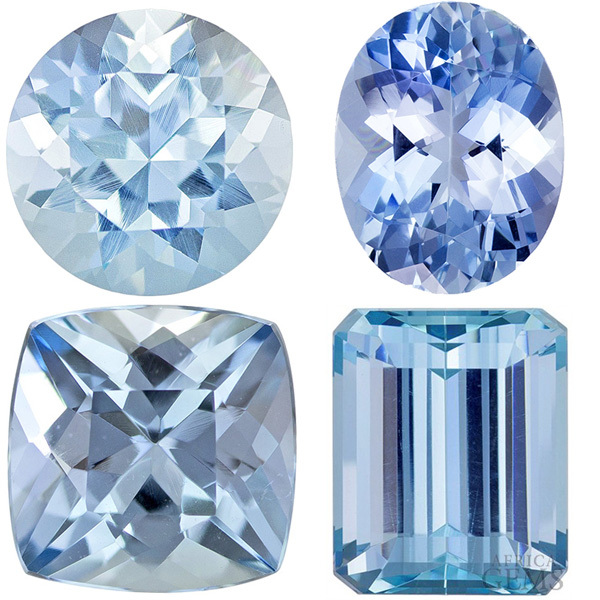 One will still see more blue topaz jewelry than they will aquamarine jewelry in the average jewelry stores because blue topaz is much less expensive and therefore more affordable to more budgets. That is not to say that aquamarine is not affordable because it is. Where Can You Buy an Aquamarine Gems? One of the interesting things about aquamarine is that most jewelry stores don't carry a large selection of fine aquamarine jewelry even though it is a favorite among the high end designers of jewelry. It can be classically cut in an emerald cut but it also lends itself to more modern 'fantasy'cuts you won't see in many other gemstones. Some of the most exquisite high end jewelry designs for necklaces, earrings and rings with blue gemstones is fashioned around aquamarine. 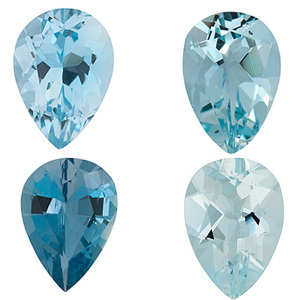 Aquamarine is often thought of as a gemstone designer's dream blue gemstone. AfricaGems.com will always have a relatively large selection of aquamarine available to individuals and jewelry designers in part due to Marc's love of the gemstone. 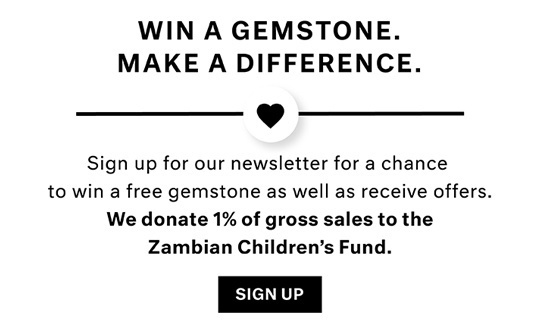 Mining Aquamarine Gemstones in Zambia is how the founder of AfricaGems got started in the gemstone business. AfricaGems has always had the best reputation for high quality aquamarine gems and our fine faceted aquamarine gems are all cut to exceptional gemstone standards. Aquamarine gemstones have been used for thousands of years. The first documented use aquamarine dates back to the Greeks between 480 to 300 BC. Some believed that aquamarine came from a mermaids treasure chest. It was also associated with Poseidon, Greek god of the seas and with the Roman god of water (freshwater) and sea 'Neptune. In the 19th century it is believed that astronomers named the planet Neptune because the deep blue gas clouds that shroud the planet gave those early astronomers the impression that there were oceans on the planet. Since the planet Neptune is the ruling stone for the Zodiac sign of Pisces that makes aquamarine the birthstone for those born under that sign. The Modern Birthstone list created in 1912 designates aquamarine as the birthstone for March. Ancient mariners used to wear amulets of aquamarine to protect them from rough seas which were believed to be caused by the wrath of Poseidon. Aquamarine was also believed to render them fearless, protect them from sea sickness and bring them luck. There are those that believe wearing aquamarine will bring a happy marriage, that it symbolizes loyalty and trust and / or that it will give the wearer foresight or courage or youth or make the wearer smarter. It is supposed to make one more serene, eliminate phobias or fears, cleanse the mind and promote self-expression. For those who believe in the healing powers of gemstones, aquamarine is supposed to help ease arthritis, eye inflammation, sore throats and varicose veins. That's a powerful stone if you are so inclined as to believe in all those attributes. Aquamarine and most beryl's occur in geological formations known as pegmatites. They can occur in vugs, also known as pockets, as well as encased by quartz and feldspar. Aquamarine gems are commonly found along with Tourmalines. The traditional producer of aquamarine has been Brazil, but in more recent times Where are aquamarines mined? Aquamarine is mined in Brazil, Africa (Kenya, Mozambique, Nigeria and Tanzania), Pakistan, Madagascar, Siberia and the United States with Brazil and Africa being the largest producers.. The largest high quality gem crystal ever discovered, in the early 1900's was a 200-kilogram absolute gem quality crystal found in Brazil. It was so clean that one could read newsprint through it! The best quality aquamarine stone is a beautiful clear calming pure blue color with little to no gray undertones or secondary hue . When considering an faceted aquamarine gemstone, carat weight is one of the least important considerations. Color tone and cut are without a doubt the most important characteristics to consider. But with aquamarine the old adage of 'the darker the color of the gemstone, the more valuable it is doesn't apply (see below) 'Tone is the primary consideration. When considering aquamarine, you will hear terms like 'Santa Maria'or 'Martha Rocha'to describe what many believe is the best color of aquamarines. The term 'Santa Maria'comes from the color of aquamarines that were first mined in Brazil and come from the Santa Maria de Itabira mine. Aquamarines mined in Africa that have the same color as those mined in Brazil may be referred to as Santa Maria Africana. Some will use the term 'Martha Rocha'to describe the blue color of an aquamarine. In the mid-1050s, a very large aquamarine crystal (approximately 74 pounds) was found and many considered it one of the most beautiful ever found. It was named for the 1954 Brazilian beauty queen Martha Rocha because it was supposed to be a match to the clear blue color of her eyes. 1. 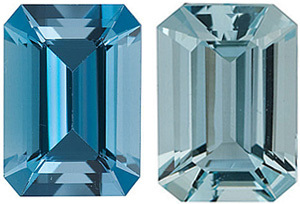 Aquamarine Cut - The cut and 'make'(proportions) are very important when evaluating an aquamarine. If the make of the gemstone is not good, the aquamarine will appear dull and lifeless 'a sad fate for such a bright lively gemstone. Aquamarine is a dichroic gemstone and may appear almost colorless when viewed from one angle and appear vivid blue when viewed from another angle. 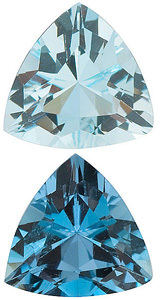 That is another reason the cut of an aquamarine is so important 'to get the best color when viewed from any angle. Aquamarine gemstones cut with low crown angles produce higher brilliance while those gemstones cut with higher crowns will deepen the color. 2. Aquamarine Hue 'The best hue for an aquamarine should be a pure medium hue of blue (think robins egg blue) although some prefer a slight green secondary hue. Having said that, most collectors of aquamarine believe that if the green secondary hue is too great, the aquamarine is less valuable. 3. 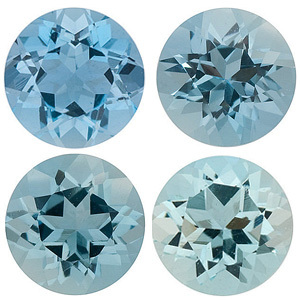 Aquamarine Tone 'Unlike most gemstones where the best tone is in the 75% to 85% range, some experts believe the best tone for an aquamarine is between 50% and 60%. If the tone is in the lower range of 10% to 30% range it will appear washed out and if it is above the 60% range, it will have too much grey. 4. Aquamarine Saturation 'Aquamarines should be vivid on the saturation scale. Saturation ranges from "grayish / brown" to "vivid". Think of the word "intensity" when evaluating saturation. There are 6 levels of saturation with 1 being the most gray / brown and 6 being the most vivid. 5. Aquamarine Carat Weight 'Aquamarine do occur in large clean crystals so the size of the finished aquamarine is not as important when evaluating an aquamarine. A 40 carat very pale aquamarine will be worth the same as a very fine deep blue aquamarine of 1 carat size. 6. Aquamarine Clarity 'Aquamarine is a GIA Type I meaning that they are normally clean gemstones. 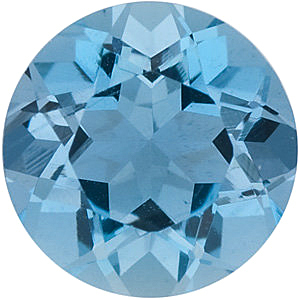 Occasionally, one can find a well cut but included aquamarine in which the inclusions (hollow rods) align and create a cat's eye or a six ray star effect, but these are very rare and you can expect to pay a premium price for this kind of aquamarine. 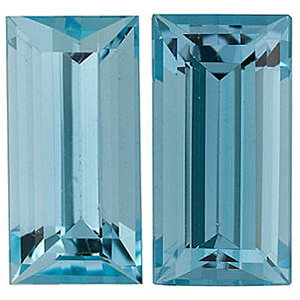 Bottom line, an aquamarine should be clear and bright and sparkle in any light, including low light. If you love the aquamarine by daylight, it should improve in incandescent light. 7. Aquamarine Hardness - Aquamarine is rated an 8 on the Mohs hardness scale and jewelry made with aquamarine is suitable for everyday wear. 8. Aquamarine Gemological Report - A buyer who is considering the purchase of a loose aquamarine gemstone should request a professional gemological report in order to help them know exactly what they are purchasing. Grading reports may be shown using a numerical value and / or percent or be given an overall letter (B thru AAA to GEM) and description "grade" for the clarity and color - it will depend on with which laboratory the gemologist trained. There are several recognized laboratories like Gemological Institute of America (GIA - uses the numerical scale), International Gemological Institute (IGI), International Gem Society (IGS), European Gemological Center (EGC) and other Tier 1 laboratories. 10. Aquamarine Gem Treatments 'Fine aquamarine does naturally occur without treatment but most aquamarine on the market today is heat treated to remove the yellow or brown hue. This treatment is not detectable by gemological testing because the heat applied is at such a low temperature. This is a permanent treatment and adds to the value of an aquamarine gemstone.